Breaking down the proscenium divide in the Schaeffer Theatre, the creative team that makes up zoe|juniper sets the stage for their performance this weekend. Their third return to the festival, the dance-design duo Zoe Scofield and Juniper Shuey present “Clear and Sweet,” a work which relishes tradition while breaking through its confines. The viscerally compelling amalgamation of movement, visual design, and sonic tradition and innovation promises a unique experience for each audience member, one that is thoughtfully crafted albeit different than the person across the room. Scofield’s choreography is heavily influenced by her ballet training, upholding the technical prowess necessary to accomplish such feats, but breaking down the elements to find rhythmic and physical variance. Scofield’s visionary choreographic choices enrapture the space, sending dancers spiraling in very intentional paths coming into contact with one another only to find themselves alone shortly after. Trust is emphasized, blindfolds are worn, community is encouraged. It is rigorous and precise, provoking thoughtful inquiries and deeper thinking, a moving picture of brain, body, and being. The movement is just one element of this performative expedition, wholly important yet only a piece. 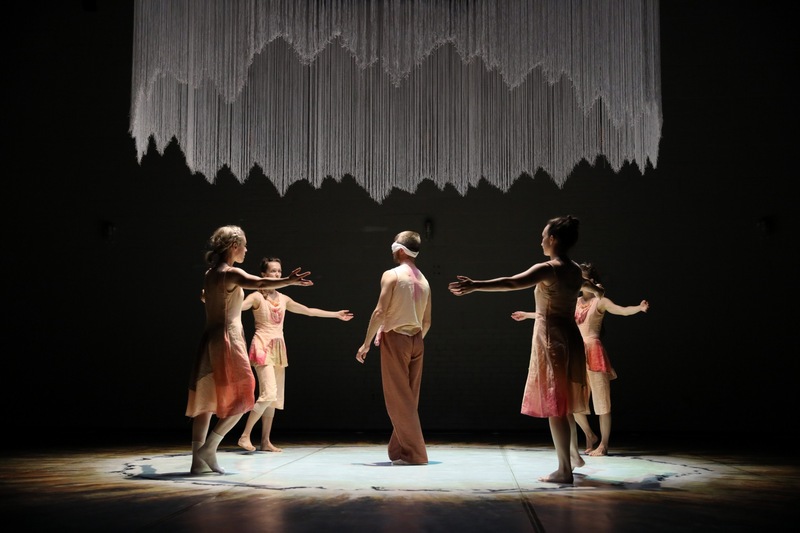 Juniper Shuey’s visual design gives a notion of roundness, centralizing the dancers and giving them boundless space within the performance area, allowing them to be fully and uniquely seen. A circular band of strings dangle magnificently from the ceiling, and beneath it, a warm ring imprints the floor – making these disconnected entities one – as if the band of strings had left this imprint, or the strings had risen from it. Shuey’s work hones in on center, centralizing and dispelling energy to the space and the borders, etching this memory within it, a space filled with dancers and audience members alike. Washing over and padding the theatre, the work becomes even more enriched with aural movement and transposition. The sound for the work comes from traditions of Sacred Harp Singing, as does much of the inspiration for the work itself. The singing is live and allows audiences the opportunity to participate, mirroring the traditions of Sacred Harp Singing – in which it is not a performative act, but a ritual of participation. Local Maine singers and recorded sounds become atmospheric and resonate differently with each audience member, dependent entirely on their seat. It is rich and provocative. This, layered with Evan Anderson’s new compositions, heavily influenced by the elements of death metal, support the work, creating yet another unique and necessary entry point in. “Clear and Sweet” provides each viewer with a unique experience from their particular angle. It feels like a hollow abstraction teeming with life. The choreographic, visual, and sonic elements come together to create a unique experience, one that examines ritual, redemption, and community, while highlighting and providing shifting points of perspective. It allows audiences the opportunity to be alone, together; filling a porous container that is constantly collapsing in and expanding out. This post was written by Phoebe Ballard. Phoebe is the BDF Social Media intern for the 2017 summer. All images by Jonathan Hsu.